Enjoying this creamy soup feels like pure comfort food, filling me up but without leaving me feeling too heavy. To be honest, I’m not a big fan of watery soups. 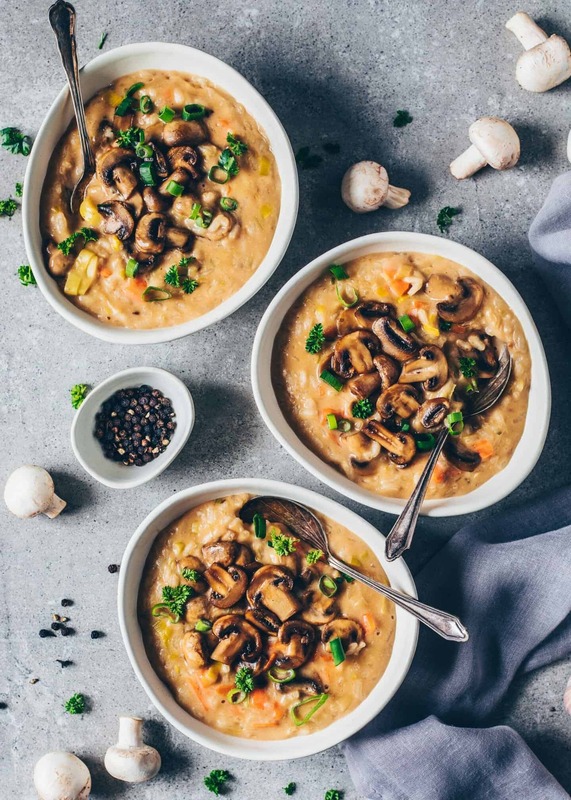 But I really LOVE thick and creamy soups which are loaded with healthy plant-based ingredients to satisfy and nourish my body! Are you with me? If so, this recipe is one you’ll definitely want to make again and again! If you’ve been following me for a while, you may have noticed that I am one of the biggest mushroom lovers ever! I totally adore serving any kind of meal with this hearty vegetable, especially pasta and gnocchi, because it packs so much flavor and the meaty texture is just perfect if you want a vegan meal without missing the meat! 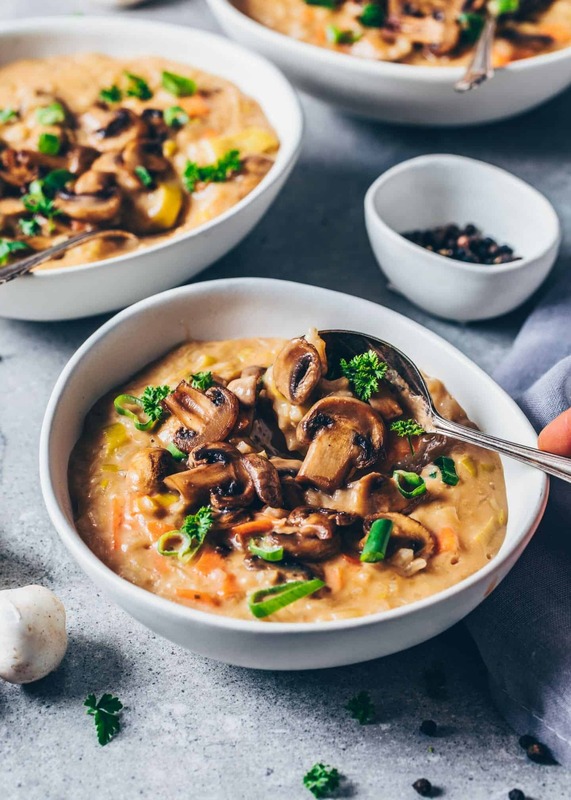 Not to mention, Mushrooms are also very healthy because they contain a lot of nutrients and plant-based protein, and as a bonus, they don’t have many calories! How amazing is that?! 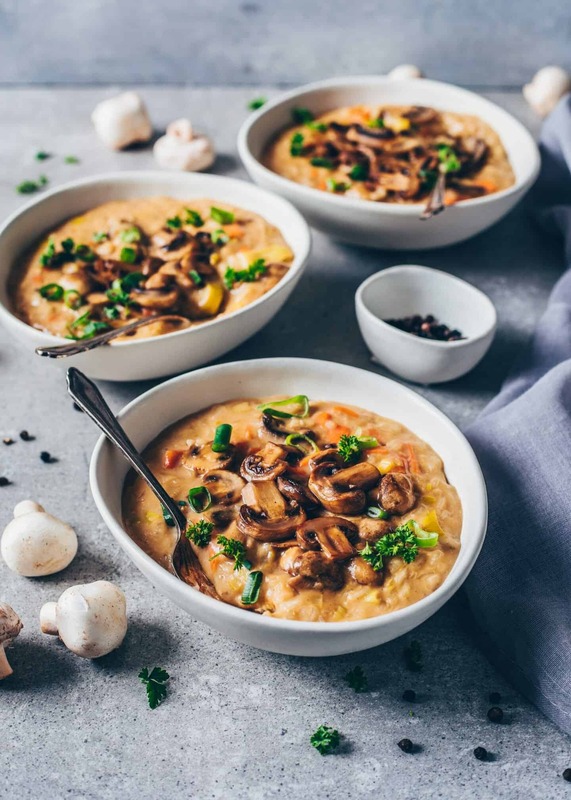 While traditional creamy soups are often made with rich dairy-based heavy cream, I made mine healthier and used only non-dairy ingredients. 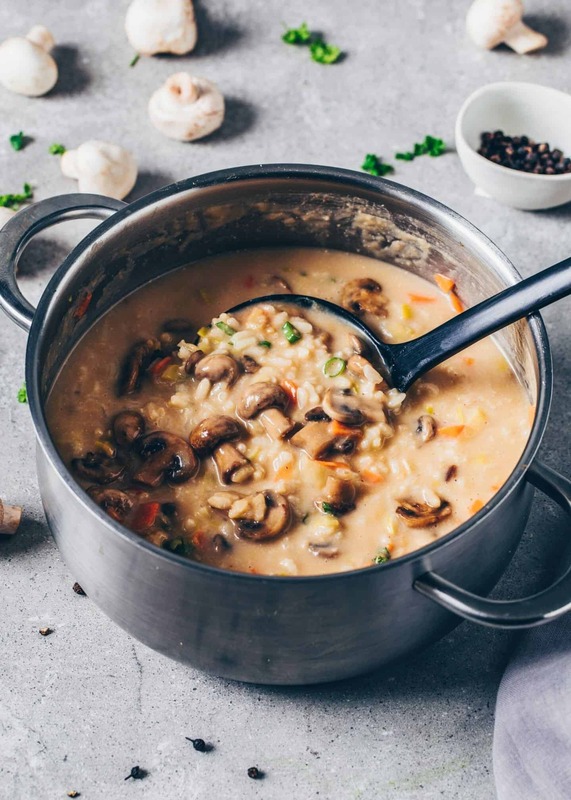 Also, we don’t need to add any thickeners or unusual ingredients because the creaminess comes mainly from the cooked rice, non-dairy milk and a little bit of flour. This way, in my opinion, is not only healthier but it also tastes even better! 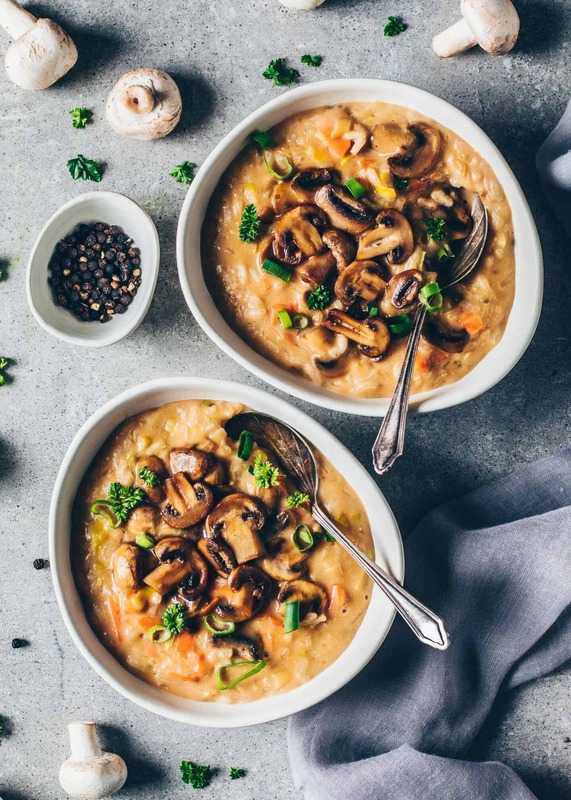 I mean, is there anything better than enjoying a creamy dreamy soup that’s delicious and healthy at the same time?! I don’t think so! Which kind of Rice can I use? 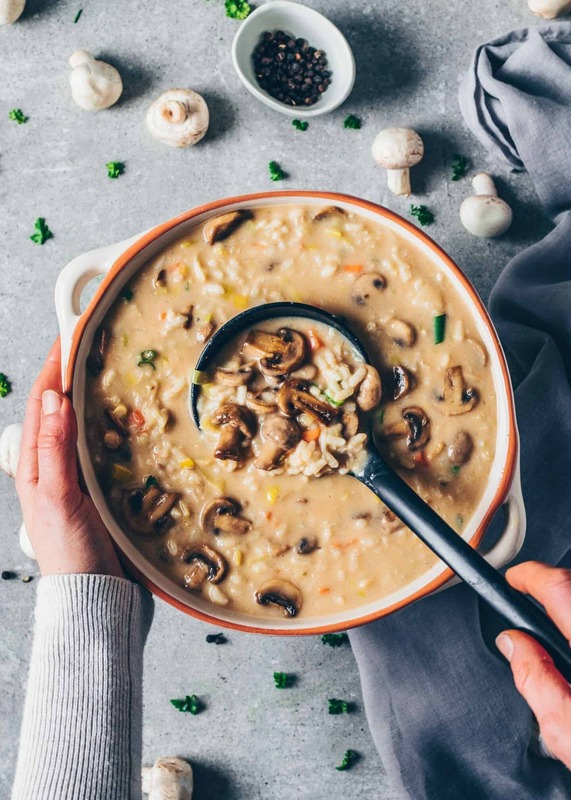 Mushroom and rice soups are often made with wild rice because it has a delicious nutty flavor and doesn’t get too mushy when adding it into soup. However, I’ve already tried different variations, and I find that the soup also tastes very delicious when using other types of rice. My favorite is basmati or jasmine rice, but it’s totally up to you which you like best. There‘s only one important thing you have to keep in mind when buying the rice. Because all types of rice vary in cooking time and the amount of liquid needed. While real Canadian wild rice takes about 40 minutes to cook and needs a little more water, there’s also a basmati & wild rice blend available which takes only 15 minutes to cook! Brown rice takes usually about 35 minutes and white jasmine rice or basmati rice often takes only 10-15 minutes until tender. There are even minute rices that take 5 minutes to cook, however, I do not recommend using these. So please make sure to always check the package instructions. Also, add a little bit more water if you notice that the soup is getting too thick. 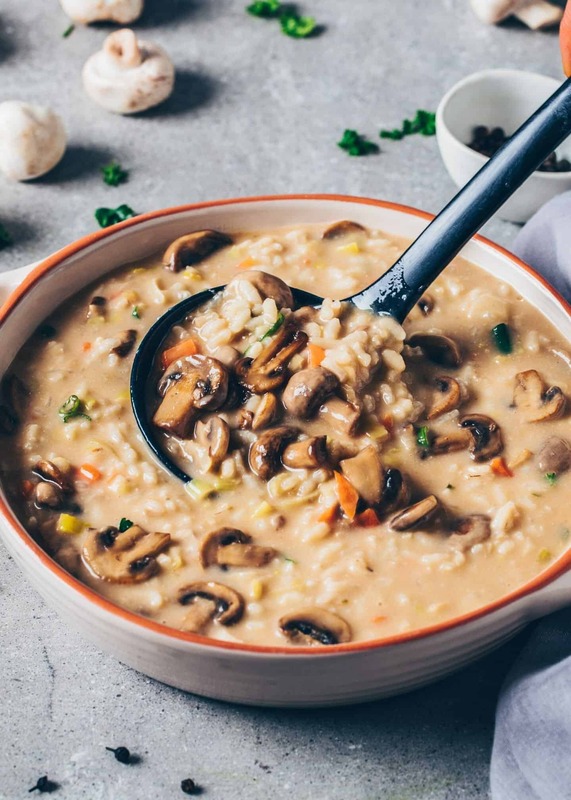 This Creamy Rice Soup is also totally delicious when adding other vegetables, such as sweet potatoes, pumpkin or squash, cauliflower, broccoli, chickpeas, etc. The base for this recipe will be always the same. Simply start with stir-frying the veggies as mentioned in the recipe instructions, then cook with the rice until tender. I haven’t tried making the soup with other grains that are similar to rice yet but please, by all means, feel free to give it a try. Another idea is to make this soup with pasta instead of rice, however, I‘m not sure how it’ll turn out. Anyways, I think, it would be also delicious. 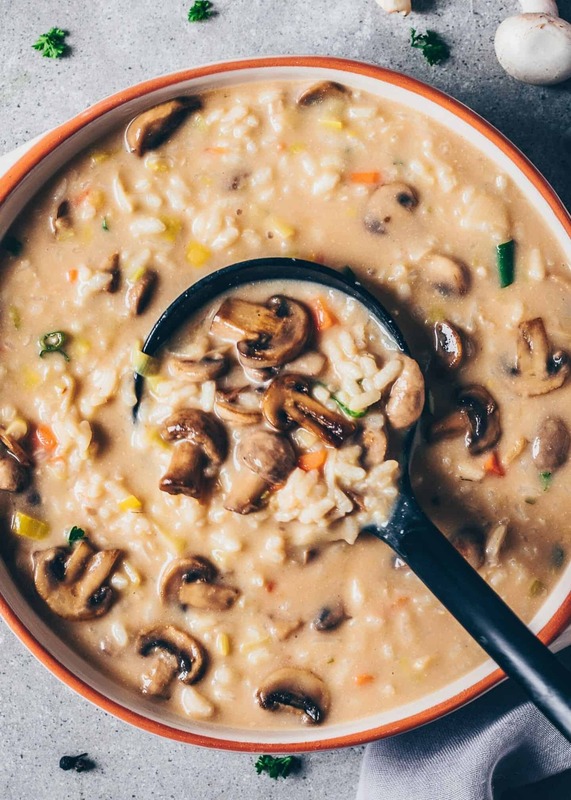 This healthy creamy soup is super easy to make. Also, if you use a type of rice with quick cooking time, it comes together in 30 minutes or even faster. But you could also make the rice separately in advance, so you can cook the soup anytime in less time! 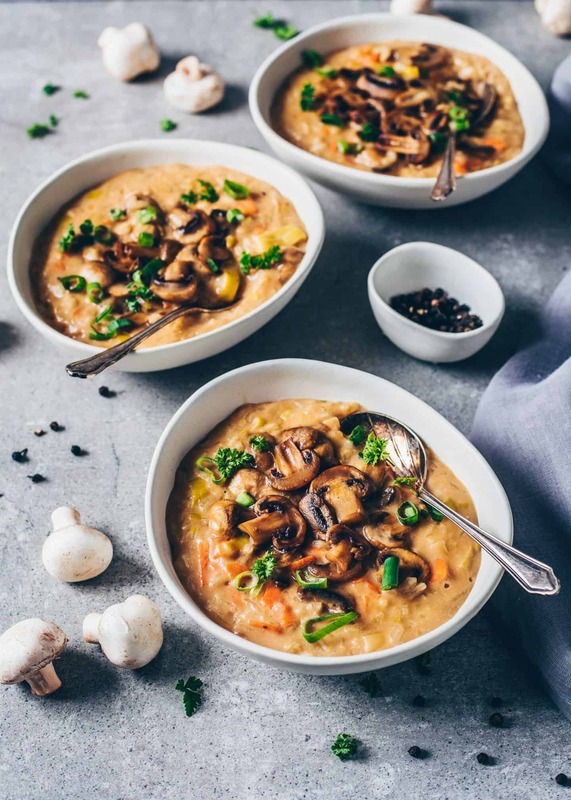 And if you have an instant pot or pressure cooker, this recipe would be also perfect for that. Anyways I don’t have one, so I always cook the soup in a large pot on the stove. Heat the oil in a large pot (or dutch oven), over medium-high heat. Add the carrots, celery, leek (or onions), and mushrooms and sauté for about 6-7 minutes, or until tender, stirring occasionally. Add the garlic, paprika, oregano, and thyme and cook for an additional 1-2 minutes, stirring frequently, until fragrant. Sprinkle the flour over the veggies and stir to combine. (It‘ll get lumpy but that’s normal). Add the vegetable broth and rice, give it a good mix. Bring to a boil, then reduce the heat to medium-low, cover and simmer until the rice is tender, about 15-20 minutes. (The cooking time may vary, depending on the type of rice you use. Please make sure to check the package instructions). Stir in vegan parmesan cheese, if you like, for an extra delicious cheesiness. The cooking time may vary, depending on the type of rice you use. Please make sure to check the package instructions and read my text "How to cook Rice" above this recipe for additional information! To make the soup gluten-free, I recommend using a gluten-free flour blend 1:1. Making it ahead Tip: You can cook the rice according to package instructions in vegetable broth ahead and store it in the fridge. 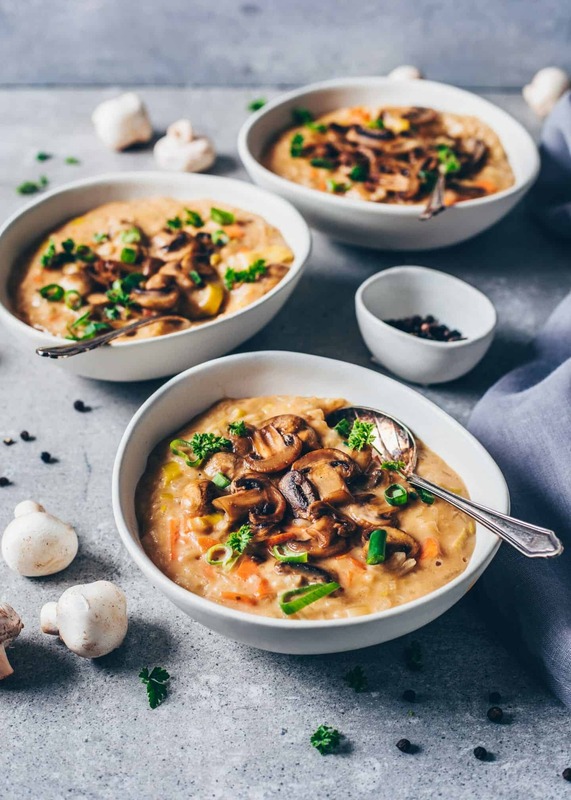 To cook the soup, simply sauté the veggies until tender, then add the flour, wine, about 4 cups broth, and non-dairy milk, and cook for a few minutes. Add cooked rice and cook until heated through, adding more liquid (or flour) until it reaches the desired consistency. Serve immediately! The soup is best eaten right away as the rice will continue soaking the liquid when it cools. 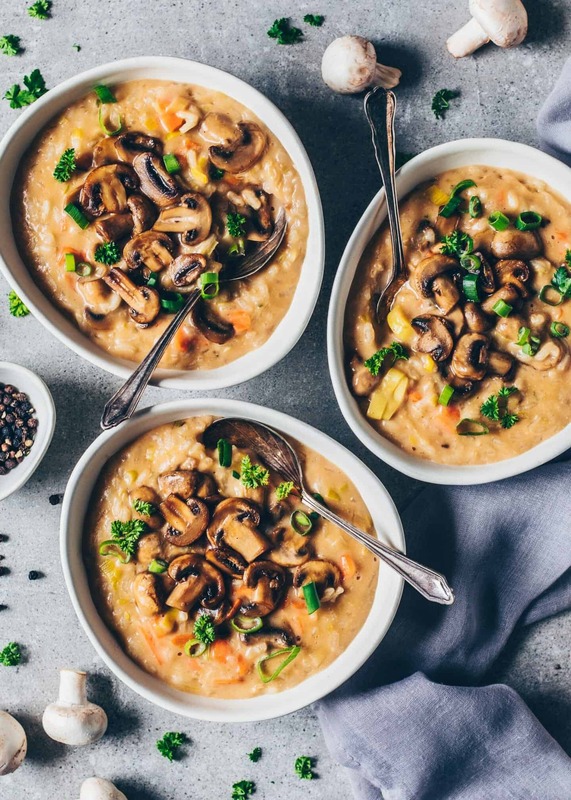 If you are not making this soup vegan, you can use regular butter, milk or cream and parmesan. You can add any veggie of your choice too. Suggestions are mentioned in the text. I made this soup and it is sensational. 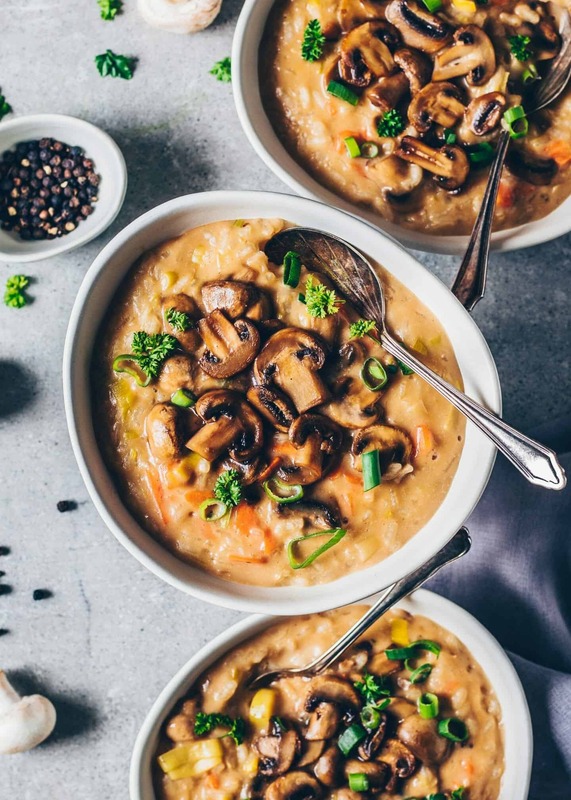 Warm, hearty and delicious!